This week I took a long walk down to the Stanford Redwood City campus. I last wrote about how this project was proceeding just over a year ago, in November of 2017. While residents of the Friendly Acres neighborhood (of which this project is a part) and the nearby Redwood Village neighborhood are likely quite familiar with this project and its day-to-day progress, those of us who live elsewhere in the city (and those of us who don’t live in Redwood City at all) don’t often have reason to drive down Broadway to the project site, and thus aren’t necessarily up on the project’s current state. Thus, this week I went back to check on the project. Stanford’s project is planned to be built in phases. Ultimately they envision nine office buildings, two “amenity” buildings, one support building, and the necessary parking on their site bounded by Broadway, Second Avenue, Bay Road, and Douglas Avenue. In addition, they plan to eventually build a tenth office building across Broadway, along with more parking and the site’s “Central Energy Facility.” For this first phase, though, they are building four of the office buildings, the amenity buildings and the support building, and one of the parking structures on the main site, along with the Central Energy Facility. 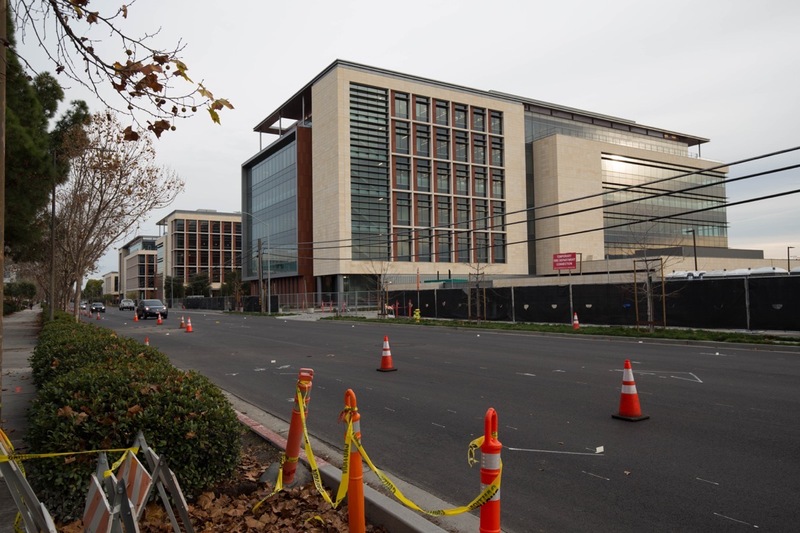 As you can see in the image above, the four office buildings are all lined up along Broadway, facing Stanford Medicine’s Outpatient Center, which sits directly across the street. 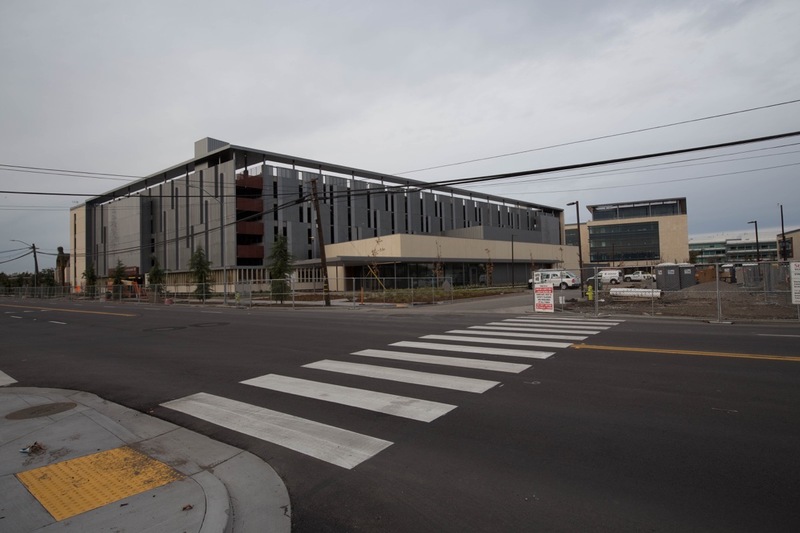 Just so we’re clear, the Stanford Medicine Outpatient Center is in no way connected with the project now under construction. This new project is a non-medical, non-academic campus that will house offices for administrative functions of various University departments. People who work there will be Stanford employees who don’t need to be located on the main academic campus in Palo Alto. This will include hundreds of employees who act in support roles for Stanford’s School of Engineering, Graduate School of Business, Law School, and School of Medicine. They will work alongside people from Stanford’s Property Management Office, Human Resources department, Land, Buildings, & Real Estate department, and its Business Affairs office. 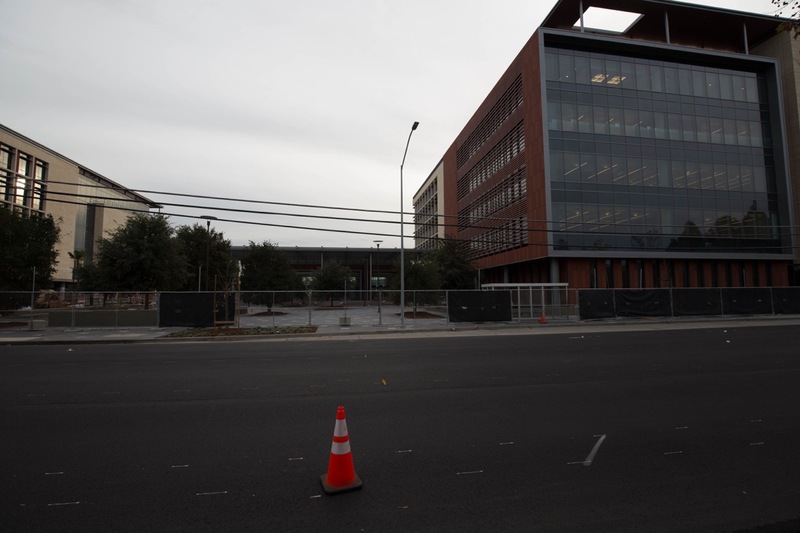 As well, the Redwood City campus will be the new home to a number of employees of Stanford University Libraries. Heading down Broadway from Woodside Road, the first building you come to is also the largest of the four. The bulk of the building is made up of office space, but a one-story portion includes a café and kitchen. That café will be open to the public: those of us who don’t work for Stanford can apparently just wander in and buy breakfast or lunch (they don’t plan to serve dinner on a regular basis). In front of the café will be an open plaza with outdoor seating; not only will we be able to patronize Stanford’s café, but we’ll be able to dine al fresco as well. 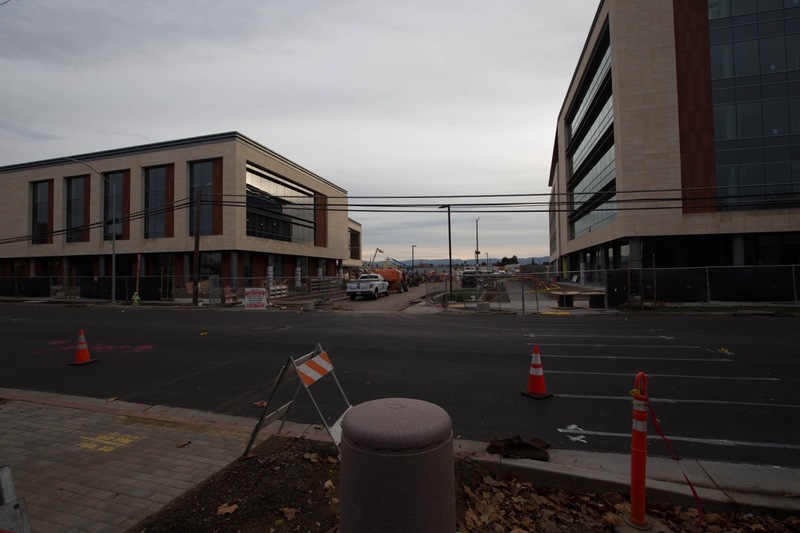 The above picture shows how Barron Avenue will divide the fourth office building from the center two. Similarly, Warrington Avenue will divide the first office building (shown in the first two pictures) from the center two. Because I won’t be able to get inside these office buildings once they are complete — and because they are office buildings, and not likely to be very exciting inside — what I’m really hoping to see are the 2.4 acres of public spaces that this project will provide. The Stanford project site stops just short of Second Avenue. Along Second is a fire station (at the corner of Broadway and Second Avenue) and a 1.5-acre park: the delightful Andrew Spinas Park. 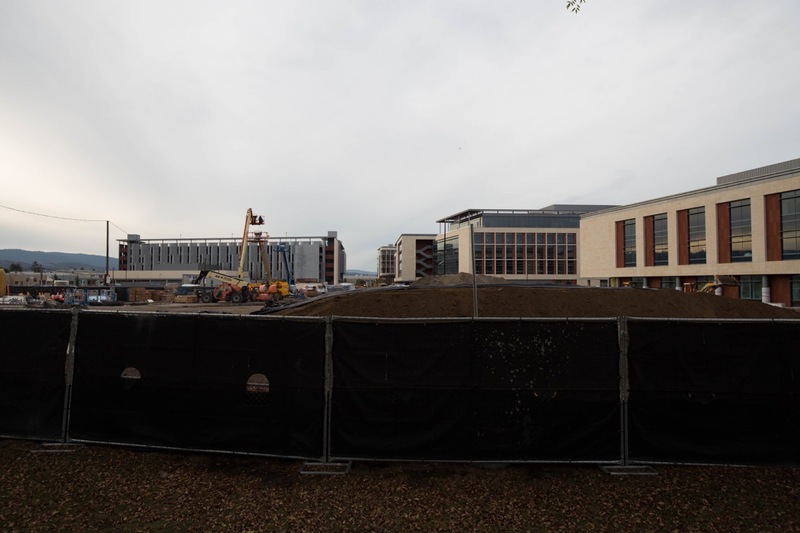 The Stanford Redwood City project will ultimately have a large open space just behind that park, and it appears that the two will be connected so as to make the park feel larger (the open space will remain Stanford property, but will be open to the public). From that open space there will be a meandering “greenway” that will wind through the center of the campus, ending up at another open space at the north-west end of the Phase 1 project. Landscaping goes pretty quickly, however, so I don’t expect this part of the property to look like this for long. The park is to the right, behind the trees and hedging. The building you see straight ahead is out on Broadway, close to the corner of Broadway and Second Avenue. I took the above picture while standing at the intersection of Bay Road and Barron Avenue. What may look like a driveway in front of the support building is actually the extension of Barron Avenue that will slice through the property and connect to Broadway. Incidentally, the other amenity building, which will house the campus child care facility, has not yet been started; it will sit across Barron Avenue from the support building. That building will include a large exterior fenced play yard, and is designed to serve 100 children at one time. 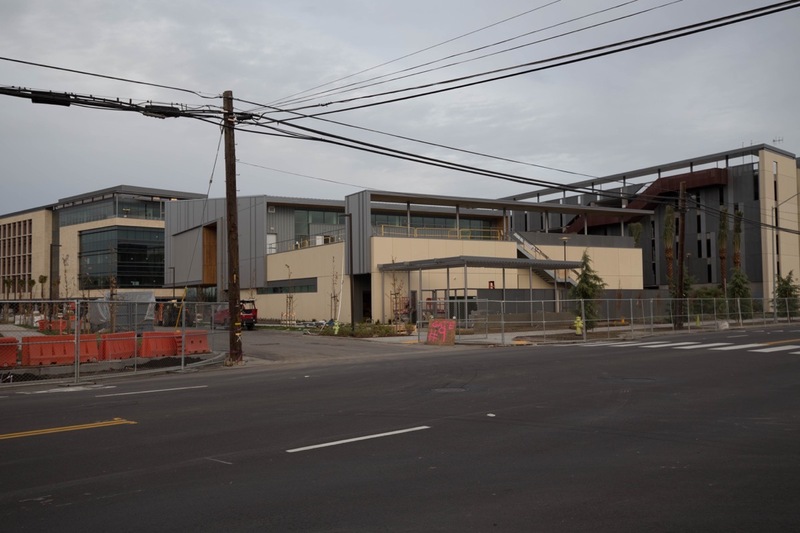 The child care facility, like the fitness center, will be open to all Stanford employees, including those working at the adjacent Stanford Medicine Outpatient Center. 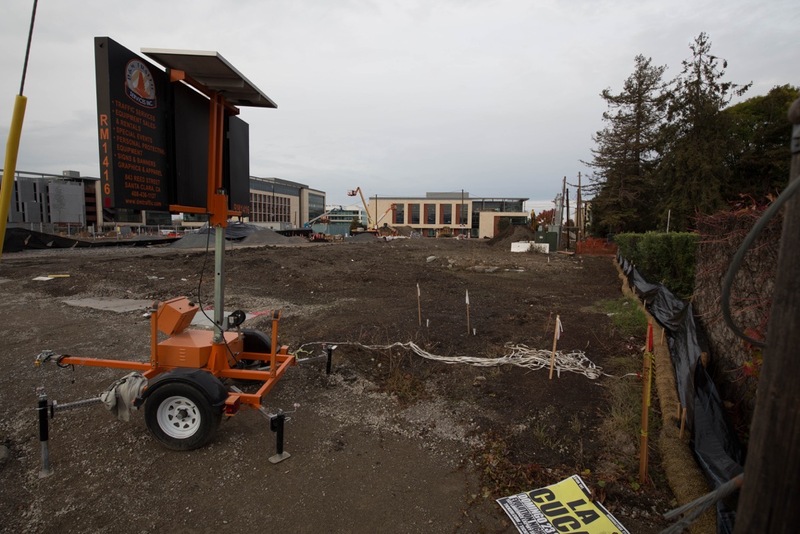 Stanford appears to be building an attractive campus in Redwood City, one that will employ a great many people. Those people have to get to and from work, however, and so one downside of this project is the increased traffic it will bring. 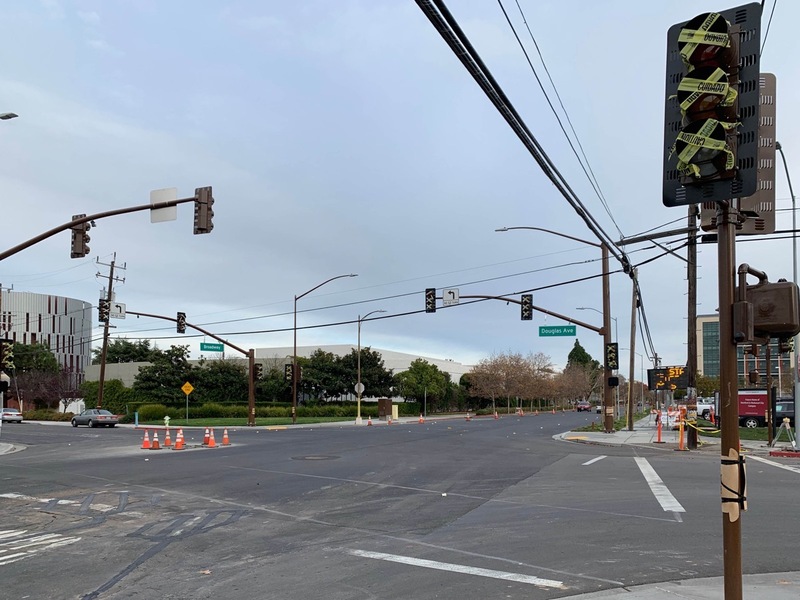 Stanford is doing what it can to ease the flow of traffic in the area, including adding signals to the intersection of Broadway and Charter Street and completely rebuilding the intersection at Broadway and Douglas Avenue. These street improvements will undoubtedly help some, but clearly they won’t be enough. A couple of new signalized intersections isn’t going to completely make up for the additional 1,300 cars heading to and from the campus during the morning commute, and the additional 1,400 or so cars heading to and from the campus in the evening commute, that are expected once the project is fully built out (Phase 1, which is what we see being built today, is just a portion of the overall project and would of course be responsible for fewer car trips). Ultimately, in order to handle the additional traffic that this and other nearby projects are projected to add to our already heavy conditions, the Highway 101/Woodside Road interchange will need to be completely redesigned and rebuilt. Redwood City has had a project to rebuild the freeway interchange in the planning and design stage for a number of years now. Funds for the acquisition of the needed right-of-way have apparently been secured, but the big dollars needed for construction — which need to come from a variety of regional, state and federal transportation funds — have yet to be obtained. If they are, the city hopes that construction can commence in late 2020 or early 2021. They expect that the project will take some three to three-and-a-half years to complete, meaning that it likely won’t be done until sometime in 2024, at best. Stanford anticipates that it will commence moving staff members to its Redwood City campus in mid-March 2019. Thus, expect to see an increase in traffic beginning around then, especially at the Highway 101/Woodside Road interchange and from there, along Woodside Road, to about Bay Road (the entrance to the campus garage is on Bay Road). As you read this, Bottle Shop, at 2627 Broadway (directly across from City Pub, in the old Goetz Bros. Sporting Goods space) is now open. From the name you might think that Bottle Shop is a place where you can buy wine, and in fact you can do that, but it is primarily a wine bar that serves small-production California wines and champagne (they also have a Kombucha and a local cider on tap, but no beer). 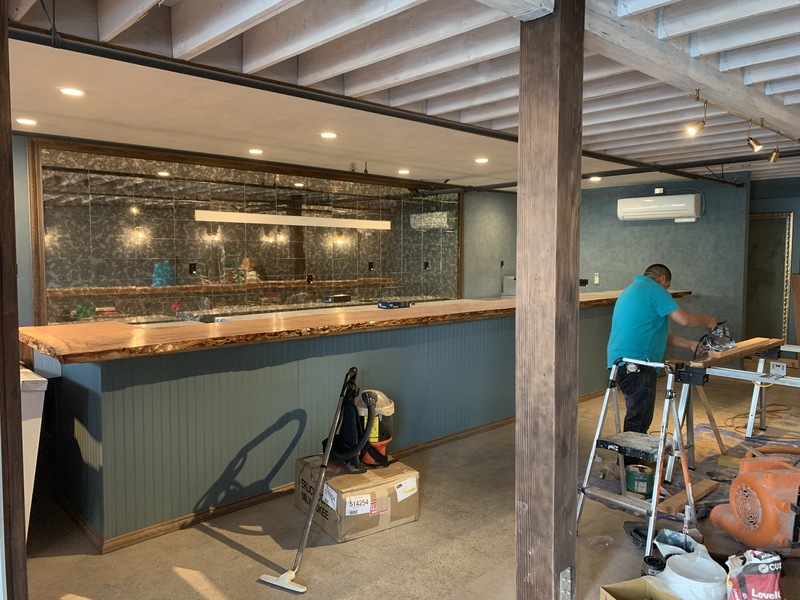 As Zu Tarazi, the owner of Bottle Shop along with his wife, Kristie (of Kristie Marie’s fame), puts it, “We’re pouring lots of California wines and hella bubbles!” Bottle Shop will also be serving cheese, charcuterie, and focaccia, giving patrons something to nibble while they sip. My wife and I managed to get there at their opening, and although we weren’t able to try any of their food, we both had an excellent glass of wine. We chose to sit at the bar, but there are also a number of cocktail tables and a long comfortable-looking couch along one wall. Soft Jazz was playing, adding to the comfortable atmosphere. All in all, this is definitely our kind of place; my wife and I will most definitely be back. Bottle Shop is open Monday through Saturday from 3 p.m. to 10 p.m. If you enjoy a glass of wine now and then, I highly recommend that you give them a try. Greg, thanks for the update on Stanford. I always appreciate your efforts in keeping the community informed about this enormous project. While there is much to love with the Stanford in Redwood City project, there are many things to be concerned about. We signed a 30-YEAR development agreement back in 2013 that delivered an anemic set of community benefits when compared to other projects that Stanford has recently done. It’s especially galling given the loss of property taxes from 35 acres of land due to Stanford’s tax-exempt status. The vast majority of hard benefits are infrastructure improvements that benefit Stanford and its new campus in Redwood City. While speaker series, concert sponsorships, and management classes are nice; telling Stanford during negotiations that we didn’t want their money and not holding them responsible for the quality of life impacts was an incredible disservice to the community. There was not a single penny spent on the affordable housing impacts that bringing 7,500 jobs to Redwood City will exacerbate. Regarding Spinas Park, Stanford recently found out their property line went through the park. Instead of donating the little slice of land to the City, they moved the fence line in, thus taking over a small part of the park. While Stanford’s new green space abuts the Spinas, it will be separated by a fence and a gate. The jury is still out as to how welcoming that will actually be. The traffic impacts created from the project will indeed be enormous and unavoidable. Combine this with the 2,000 workers and 750 new residents at the proposed Broadway Plaza project (think Foodsco), it’s all the more reason to say no to the Jay Paul Company’s request to add 6,000 office workers at the old Malibu Grand Prix site. It would be urban planning malpractice to do anything more to that intersection before the Stanford and Broadway Plaza projects are complete. Stanford will eventually be the largest employer in Redwood City going forward. Given the 30-year development agreement that is locked-in, it’s going to take a tremendous amount of work by the surrounding residents to ensure Stanford addresses impacts and upholds their commitment to being a valued addition to the Friendly Acres community.